You can see the GPS tracks for this entire hike. There are some gaps, due to the GPS not tracking. From the Lumpy Ridge parking area, we started hiking at 9:52, heading northwest on the trail to Twin Owls and the Black Canyon Trail. On the Black Canyon Trail, we headed west to the intersection of the climbers trail, marked with a sign that says "The Pear", where the odometer read 2.14 miles. We started heading up "The Pear" trail at 9:27, and continued up this trail until it faded out, then maintaining our northwest direction to the summit of "The Needles". The last part of this stretch, after the Pear Trail fades out, is very rugged, and requires some scrambling. We got to The Needles summit at 12:11, with the odometer at 5.78 miles. On the summit of The Needles, it was incredibly windy. The forecast for Estes Park was gusts of 35 mph, but up there the gusts were more like 85. Because of the wind, we didn't get to enjoy the view, for fear of being blown off the precipitous sides of The Needles. Hastily retreating from the summit, we headed northeast, then generally in a southeasterly direction along Lumpy Ridge. 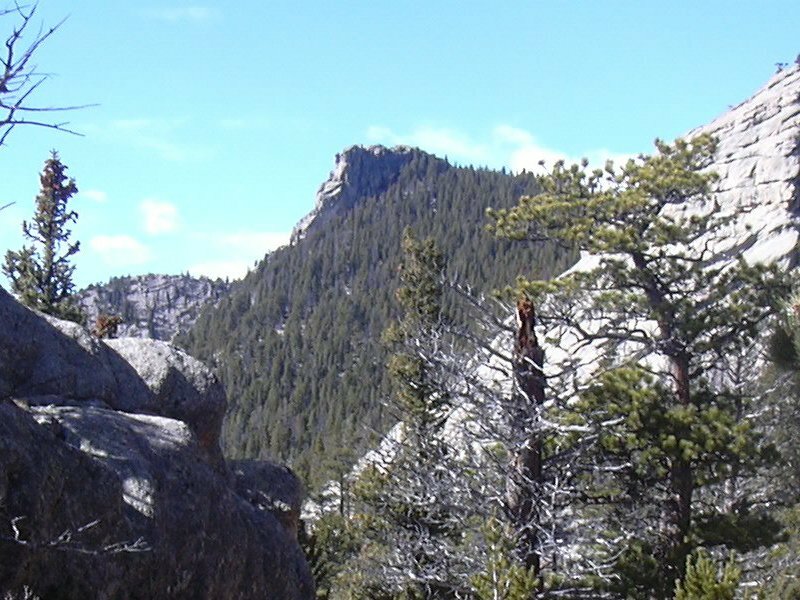 This is a beautiful rugged country of severely eroded 1.4 billion year old Silver Plume Granite. Because of the ruggedness, the going is rather slow. Heading toward Balanced Rock, along Lumpy Ridge, we continued to nearly the end of Lumpy Ridge, then descended to a drainage which we figured we would hike along as it passes by Balanced Rock. This turned out to be a mistake as the drainage was choked with dense vegetation. We had to descend above the drainage a bit, and continued east, eventually having to cross the drainage once more before reaching the Balanced Rock Trail. 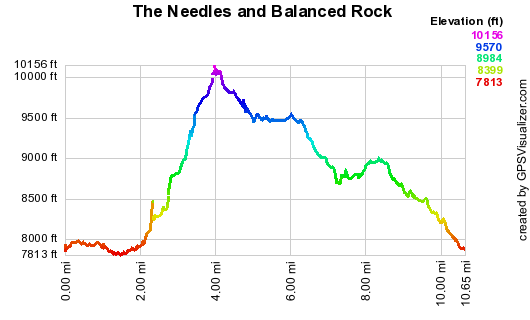 We then took the Balanced Rock Trail to its namesake rock, getting there at 15:10, with the odometer at 9.21 miles. From Balanced Rock, we headed southeast along a faint unofficial trail, and then east, scrambling through the rough terrain, until we reached the Gem Lake Trail which we took back to the parking area. We returned to the parking area at 16:43, with the odometer at 12.0 miles. This was was a rough hike through very rugged but beautiful terrain. It took us 6 hrs, 51 minutes to travel 12 miles over this rugged country. The elevation difference from lowest (parking) to highest (The Needles) was 2,204 feet, but the ups and downs were too numerous to count as indicated on the elevation diagram.